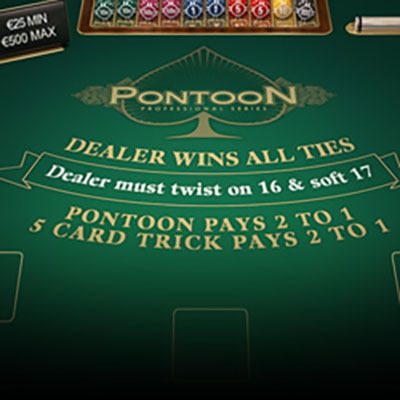 Pontoon is a British variant of classic card game blackjack, where the aim is to reach 21. NetEnt delivers a beautifully styled version of the game in Pontoon Pro, where players are transported to a lifelike casino table. Gentle piano melodies help create an authentic ambience to get you in the mood for a dabble on the tables. If you fancy yourself as a pontoon ace, this is your chance to show your skills. Use your talents to masterfully decide when to stick or twist and with a bit of luck, the cards may just be on your side to help you secure that big win. Deposit today to try your hand at this popular table game, brought to life by NetEnt. NetEnt are perhaps the most widely recognised slot game developer, with over 200 unique games in their catalogue. Their games are supported by their own innovative platform and can easily be identified by their impressive graphics and original themes. NetEnt have now been producing great online casino games for over twenty years and have created plenty of favourites along the way, including Twin Spin, Hall of Gods and Mega Fortune. With offices around the world in Stockholm, Malta, Gothenburg, Kiev, Gibraltar, USA and Poland, it’s evident how much NetEnt have grown over the years, with their success set to continue as they consistently release bigger and better games set in imaginative new worlds. Like blackjack, the aim of pontoon is to get 21 or as close to this number as possible. Both the player and dealer are dealt two cards but unlike blackjack, the dealer’s cards are both dealt facedown. With your two cards in front of you, you must decide whether to stick or twist in a bid to beat the dealer’s score. In another departure from the classic game, players are forced to twist on scores totalling 14 or less, so be sure to keep this in mind. In pontoon, if you and the dealer both reach the same score, a house advantage comes into play. What would usually award a push is in this game a loss as the dealer takes the win. There are however some additional advantages for the player in this game, as any hand that gathers five cards before exceeding 21 wins - the exception being when the dealer has pontoon (ace and picture card). If you want to raise the stakes, pontoon also allows you to double your ante by selecting ‘buy’ at any point. The game favours big payouts again by allowing players to achieve pontoon even after splitting aces. Pontoon Pro offers players the opportunity to enjoy the British variation of a traditional card game. NetEnt have created a simple and visually appealing game that is easy for patrons to understand and play, so they can focus on beating the dealer and winning those all important cash prizes. Experience the thrill of the casino tables wherever you may be, with this game by NetEnt being available for mobile as well as on desktop.